Sound bars owe their existence to flat-panel TVs. Sure, those skinny screens produce a crystal-clear picture. But their tiny built-in speakers can’t even reproduce dialogue clearly, much less deliver convincing explosions, car crashes and all the other mayhem that keeps us riveted by our favorite movies and TV shows. TV speakers are not only undersized and under-powered, they’re almost always aimed in the wrong direction, firing sound downward or toward the wall behind the TV. It’s no wonder everything comes out indistinct and out-of-focus. So the goal of the sound bar is to provide a sonic experience that more closely matches the TV’s lifelike picture. Equipment makers use a variety of methods to achieve that goal, and pretty much any sound bar you choose is going to sound better than your TV’s speakers. A lot better. Sound bars have exploded in popularity in recent years, and the number of models has likewise exploded. So we’ve put together this buying guide to help you quickly figure out what flavor of sound bar might work best for you. A sound bar is an all-in-one speaker system that delivers high-quality TV sound without requiring the space, complexity and expense of a home theater receiver and surround sound speaker setup. A sound bar’s long, slender cabinet contains two or more speakers, and may provide either stereo or surround sound. Some sound bars come with a separate subwoofer for producing deep bass, which adds impact to movie soundtracks and music. Nearly all sound bars you’ll run across are a self-powered or “active” – that is, they have their own built-in amplifiers. But there is a vanishing breed of sound bars designed to be connected to and powered by a receiver. These non-powered or “passive” sound bars lack another major advantage of active models: easy setup and operation. This article covers only self-powered sound bars, since that’s what 99.9% of folks are looking for. When shopping, you’ll run across sound bars from nearly every audio company, as well as most TV makers. A sound bar made by the same company that built your TV may be a perfect match cosmetically, or offer other compatibility benefits. But for pure sound quality, you’ll probably do better with a model from a company whose main focus is audio gear. WHERE DO YOU PLAN TO PUT IT? Knowing where you’re going to place your sound bar will immediately simplify your decision and narrow down your choices. There are two basic options. If your TV is hanging on the wall you can mount the sound bar right below it for a neat, uncluttered look. If you're going this route, you'll want to consider how you'll hide the power cord and connection cable. On the other hand, if your TV sits on a stand or cabinet, you can set the sound bar in front of the TV. In that case you’ll want to measure your stand and your TV's base to be sure the sound bar won't stick out from the stand at all. You should also measure the space between the top of your stand and the bottom of your TV screen, to make sure the sound bar doesn’t block any of the screen. Some sound bars can be positioned either with the speakers facing forward, or laying flat with the speakers facing up, for just this reason. Sound bars come in a wide range of sizes, from barely a foot wide to nearly five feet long. The right size bar for you will depend on the size of your room, the size of your TV, and your personal preferences. If you plan to do at least some of your shopping in actual brick-and-mortar stores, pull out your phone and snap a few pics of your TV before you head out the door. That way when you’re comparing models at the local big box, you can check those photos and have get a better idea of how different sound bars will look in your home. If you think you might want a sound bar with an accompanying subwoofer, that might limit your placement options a bit, but probably less than you’d expect. That’s because nearly all of these subwoofers are wireless. That is, they receive the audio signal wirelessly from the sound bar, so you needn’t connect any cables between the sound bar and the subwoofer. But you will need to plug the sub into a wall outlet for power. Also, the low frequencies that subs produce are difficult for our ears to locate, so you can usually position the sub almost anywhere in the room and still have it blend well sonically with the sound bar. Put it next to your sofa or tuck it in a corner behind a potted palm. SOUND BAR OR SOUND BASE? So far, we’ve been talking about sound bars that really do have the long, thin shape of a bar. But there’s another type: the platform-style sound bar, also sometimes called a sound base. This wide, low-profile design sits under your TV and supports it. 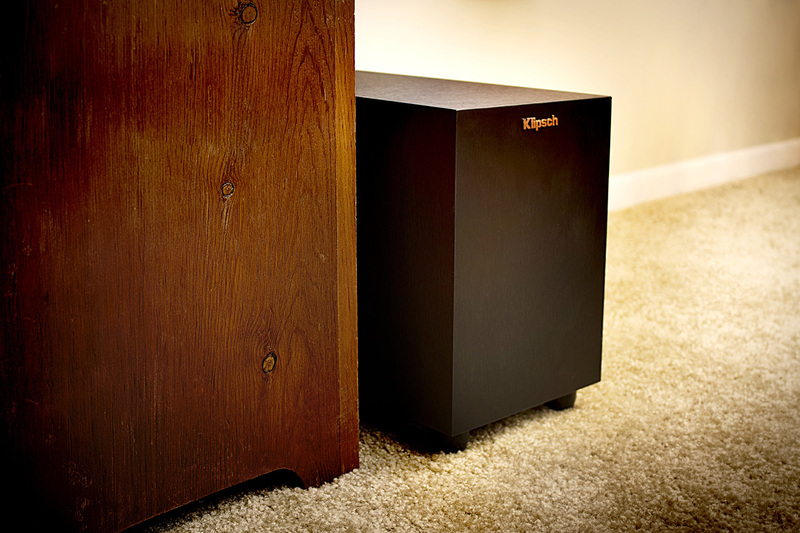 Sound bases have specially reinforced cabinets that are extra-sturdy. If you’re considering this type, check the specs to make sure it can support the weight of your TV. And make sure the sound base is wider than your TV’s base. A sound base might be your best bet if there isn’t much vertical space between the bottom of your TV screen and the top of your stand. It’s also a smart choice if you want full-range sound without a separate subwoofer. Sound bases have two advantages that help them produce surprisingly full sound. They can use bigger speakers, plus the cabinets are much larger, giving the speakers “room to breathe” so they can produce more bass. 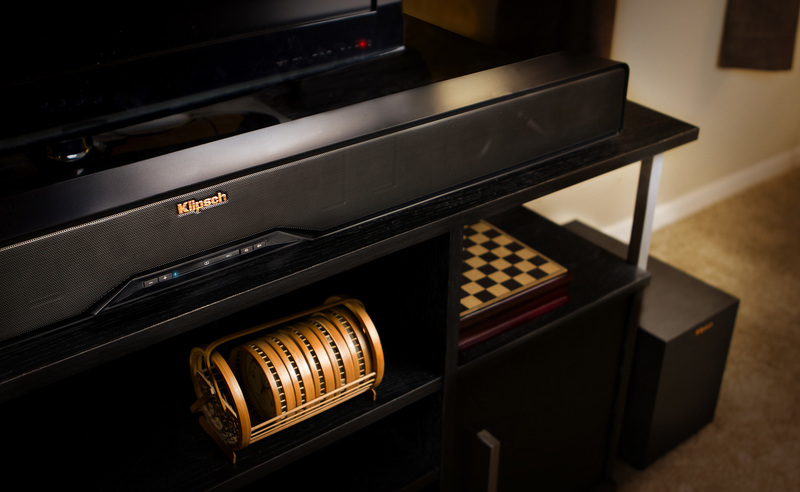 It’s worth repeating that any sound bar is going to sound way better than your TV. Basic sound bars tend to be stereo designs that reproduce the same right and left channel audio information as your TV. But they sound much bigger thanks to larger speakers powered by amplifiers with real oomph. You’ll also run across systems with two speakers, or even three speakers in a left/right/center configuration, that can go beyond the limitations of stereo. These sound bars may use Dolby Digital processing to anchor the dialogue to the TV screen and place sounds so that you get a broader front soundstage with more precise placement of sound effects. Then there are the multichannel sound bars that mimic the realistic, wraparound sound of a full-on, multi-speaker surround sound system. They typically are labeled 5.1 or 7.1 systems, with discrete sounds assigned to each channel to create a three-dimensional soundfield. A few sound bars use special “beam-type” speakers to bounce sound off your walls, tricking your ears into thinking there are speakers all around you. If you’re a “cord-cutter” who relies on your TV's built-in tuner to pick up over-the-air TV signals, and/or smart TV apps to watch streaming services like Netflix, you’ll want a sound bar with Dolby Digital decoding. Most recent TVs will pass a Dolby Digital signal to your sound bar when you’re watching an internal source – those that aren’t external components. We’ll talk more about this in the connections section. Just getting sound that’s louder and fuller than your TV’s speakers is pretty exciting, but most sound bars have a few other audio tricks up their sleeves. Actors’ voices will naturally sound much clearer thanks to bigger and better speakers, but many sound bars add dialogue enhancement features that make voices louder still and bring them forward in the mix. And here’s something we’ve probably all experienced: Watching TV at a comfortable volume level, then suddenly being blasted off the couch when a commercial comes on. Most sound bars now include technology to ensure that commercials aren't louder than show soundtracks. Another common feature is a “late night” mode that reduces volume peaks in the program, making it less likely that you’ll disturb someone sleeping in a nearby room. With the popularity of wireless music playback it’s not surprising that many sound bars now offer that capability. Built-in Bluetooth® lets you stream music easily from your smartphone, tablet, or Bluetooth-capable computer. It works with the music stored on your phone as well as your favorite streaming music apps (like Spotify®). And Bluetooth is the wireless music standard these days – nearly all iOS®, Android®, and Windows® phones and tablets have built-in Bluetooth. Some sound bars even have Wi-Fi® capability for quick access to online streaming services as well as your personal digital music library. Wi-Fi isn’t as goof-proof to connect as Bluetooth, but some sound bars include Wi-Fi-based wireless audio systems like Play-Fi, which let you set up a multi-room sound system so you can seamlessly play music all over the house. A sound bar might also have a USB input, so you can load up a thumb drive with your favorite tunes, leave it plugged in, and listen to them anytime. When choosing a sound bar, be sure you pick one with the right connections for your TV and other components. There are two basic ways to hook up a sound bar to your system. The most common way is to use your TV as a switching hub: you connect your Blu-ray player, cable or satellite box, and game console to your TV, then send the audio out from your TV to the sound bar. This is a simple approach that lets you simultaneously switch the audio and video signals when you switch inputs on your TV. Typically, you’ll make a digital audio connection between your TV and sound bar – either optical or HDMI – in order to be able to enjoy surround sound from sources that offer it. This is a particularly good way to go if you bought your TV in 2015. That’s when TV makers decided to build true Dolby Digital pass-through into their TVs, allowing connected components like Blu-ray players to send surround sound audio through the TV and on to a receiver or sound bar. Prior to 2015, if you used your TV as a switcher, the TV would convert any incoming audio to a two-channel PCM signal. That’s still playable by sound bars, and it sounds good, but it’s stereo, not surround. By the way, this is often the answer if you’re getting a picture but no sound from a connected source. Just go into the TV’s menu and you should find an audio setting for either PCM or Dolby Digital. Every HDTV and 4K TV has an optical digital output, and so does nearly every sound bar. This connection is second only to HDMI as a way of getting high-quality sound from your TV to a sound bar. And speaking of HDMI, a growing number of sound bars include HDMI connections, which means you could connect your Blu-ray player or high-def cable box directly to the sound bar. Once your sound bar is hooked up and set up, you can usually use your TV remote to control its volume. Most TV and cable or satellite remotes can be programmed to control a sound bar, or the sound bar can learn your TV's commands. Most sound bars include at least a basic remote control, and often there are free remote apps that let you use your smartphone or tablet as a remote.